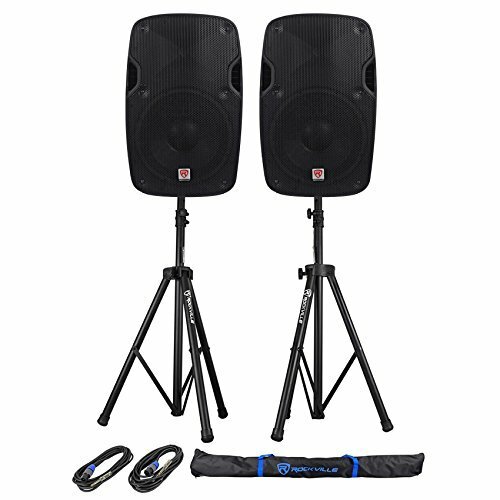 2 Rockville SPGN158 15'' Passive 1600W ABS Plastic PA Speakers+Stands+Cables+Bags by Rockville at IGWT. MPN: (2) SPGN158+RVSS2-TSNL4. Hurry! Limited time offer. Offer valid only while supplies last. The Rockville SPG SoundGig series passive loudspeakers are a quick way to expand your system, allowing you to add speakers and more power as needed. The Rockville SPG SoundGig series passive loudspeakers are a quick way to expand your system, allowing you to add speakers and more power as needed. The SPG speakers offer the same drivers and studio sound quality of the popular Rockville RPG units. They're designed for optimum performance for use with powered mixers and power amplifiers.